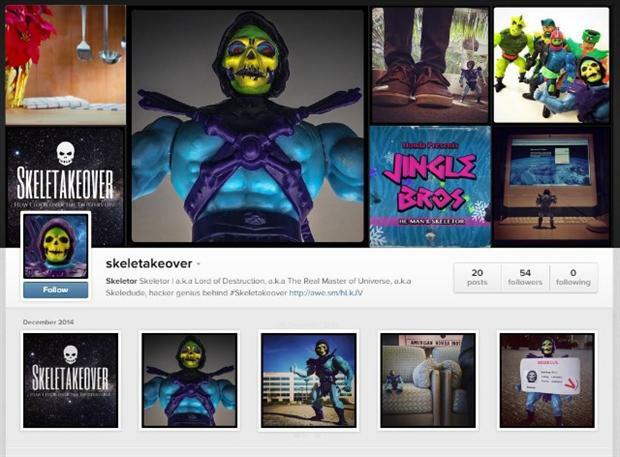 Honda's Skeletor character takes to Instagram. Nothing says festive advertising quite like a skeleton on a hacking rampage, but for Honda its early success with Skeletor has taken the character to other social media channels. Earlier this month Honda staged a fake hack of its Twitter account, using the character from its recent brand campaign Skeletor. It has just launched an Instagram account for the now "fired" character, which is using the platform to tell people how he took over the Twitterverse. Honda announced his return via its main Honda Twitter account today. The Instagram account houses images of the character in different situations, unashamedly plugging his content. "It’s a beautiful day to take over the Internet and promote my video," says the caption of an image of Skeletor at Honda HQ. Instagram is primarily being used to tease a set of festive music videos on YouTube that feature other characters from Honda’s ad campaigns including a touching duet between Skeletor and his arch nemesis He-Man, who seem to have become best friends or "Jingle Bros".